MoreArt is the new Moreland City Council Public Art Show and has been designed to respond to Moreland’s unique urban landscape and its distinct cosmopolitan character. It is open to works from across the spectrum of sculptural, ephemeral, temporary and installation based art-work. By appropriating the Tonka Truck and casting it in the role of a ruin, art is by default infused into our daily routine and environment. Each of us have a favourite toy we grew up with that we may feel a little pang of regret over when we think of where it is now. 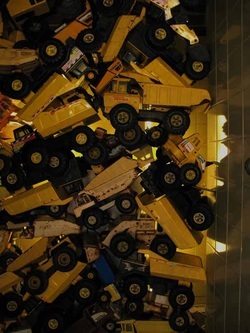 The Tonka Truck is certainly an archetype amongst toys; every generation knows them and grew up with them. When this project was first conceived for the white walled gallery space, I spent some time collecting adults' stories of their favourite toy or the first toy that came to their minds. 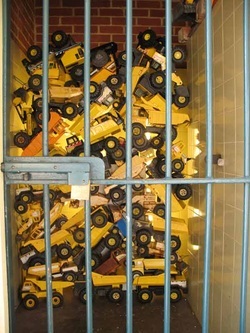 These stories would often be about how their toys were lost, and were often wistfully told with just a tinge of regret. Playing with ideas of monuments and ruins, invoking the ghosts of past childhood memories. The work has a dark undercurrent as the trucks take on the role of ruin, stacked haphazardly in the corner - forgotten, suggesting a time and place past that we admire from a distance with little understanding. So the toy truck represents an instance that has past and been discarded by the forward thrust of time. Taking this image of our shared memories and actualising it in the abandoned and discarded ticket offices of now long ago Hillside and Bayside Trains seems very apt. It is like placing a relic within another relic; all these reminders of an infrastructure that has became obsolete but was once as big a part of the cities life as the favorite toy was to the adult when they were young.